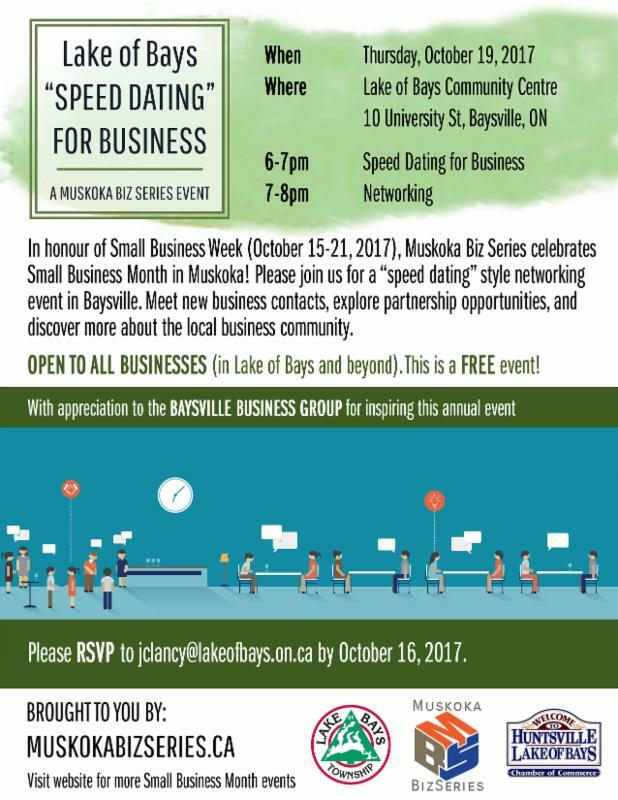 Please join us for a "speed dating" style networking event open to all businesses (in Lake of Bays and beyond). This is a FREE event. RSVP deadline: by October 16, 2017 to jclancy@lakeofbays.on.ca . Click the image to the right to open a larger version of the event flyer. 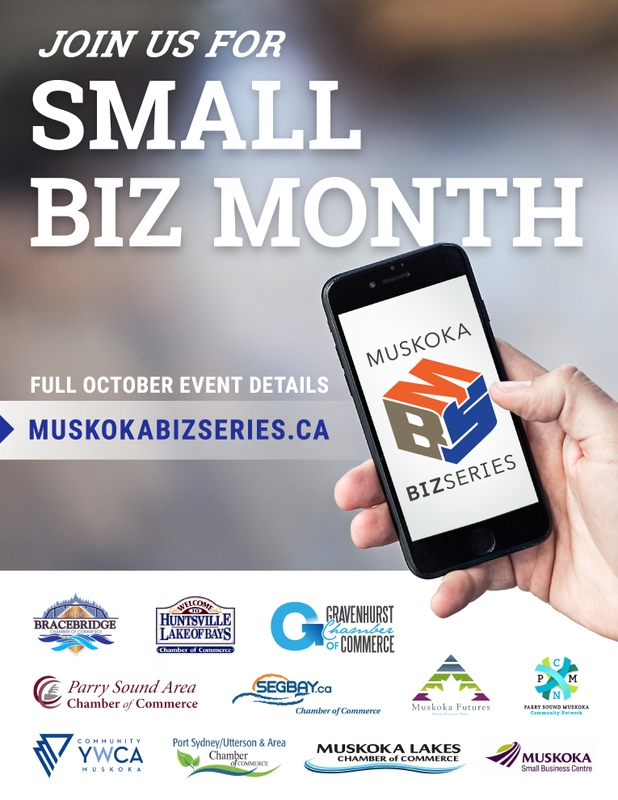 Muskoka Biz Series will help your business to stay competitive through innovative and informative events that connect business owners with leading experts and high-profile keynote speakers. Choose one or many Small Business Month events to attend such as "Speed Dating" for Business, Women in Business Networking, and more! Read this article on VentureMuskoka.ca for more information about Small Business Month in Muskoka. For full October event details, visit: muskokabizseries.ca. The Muskoka Small Business Centre is in Lake of Bays the first Tuesday of every month. How can the Muskoka Small Business Centre help you? Next Drop-in Date: Tuesday, November 7, 2017 at the Lake of Bays Municipal Office (1012 Dwight Beach Rd, Dwight). 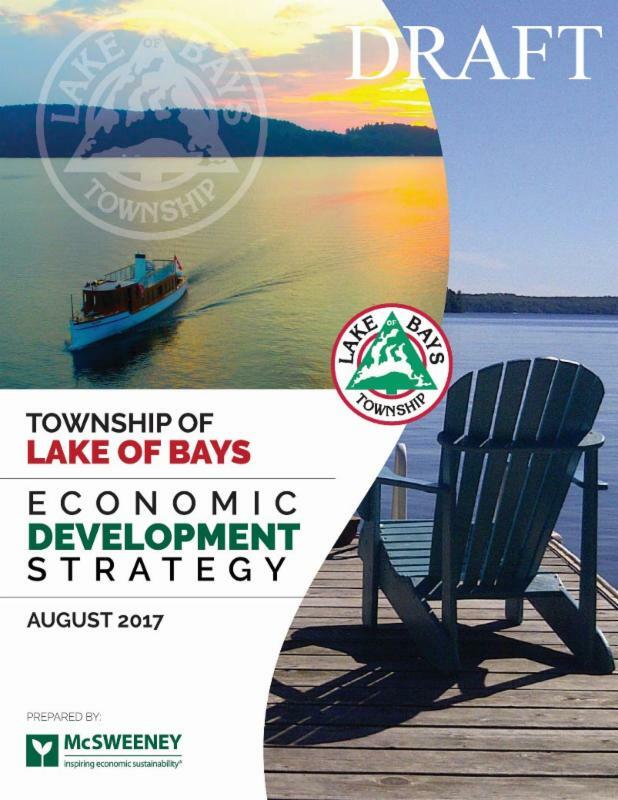 Thank you to everyone who participated in the first round of public consultation and provided direct input to help shape the Township of Lake of Bays Draft Economic Development Strategy. The Draft Strategy is now available and we’d like your input. Please take a few minutes to complete this short online survey . Survey deadline: October 17th, 2017. The Celebrate Ontario 2018 program is now open and accepting applications. Celebrate Ontario is an annual program that provides funding to help festivals and events enhance their programs, activities and services. This support helps grow tourism in the province by making it easier for event organizers to offer new and improved experiences that will attract more tourists and increase visitor spending. Application deadline: Thursday, November 9, 2017 at 5:00 p.m. via the Grants Ontario System. Are you interested in starting your own business? Are you interested in growing an existing business? 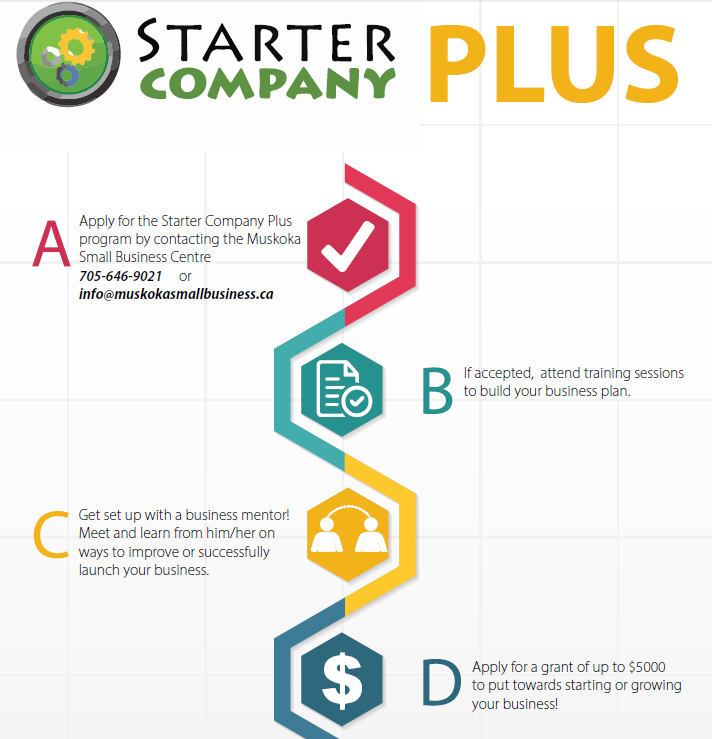 Check out Starter Company Plus - a program offered to anyone over the age of 18 by the Muskoka Small Business Centre. After completion of the Starter Company Plus program, you can apply for a grant of up to $5,000 to put towards starting or growing your business! Application deadline: October 27, 2017 at 4:30 p.m.
For more information, visit: muskokasmallbusiness.ca. 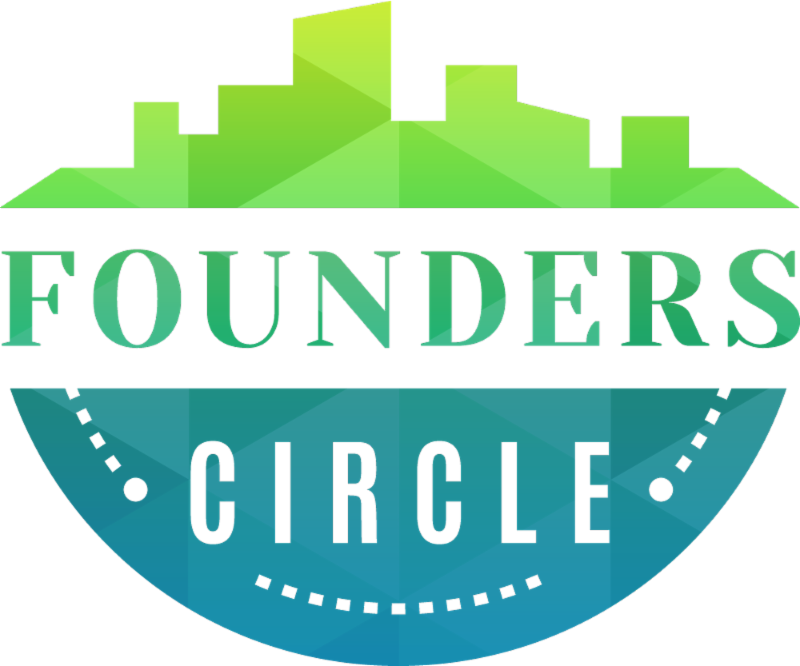 Founders Circle is a contest to find the Muskoka-based entrepreneur with the best idea and plan for a successful start-up business. The winning individual or group will win the Founders Choice Award of $10,000. Application deadline: December 2, 2017. For more information, visit: muskokafounderscircle.com. For more information and examples of innovation stories, visit: iawards.ca. 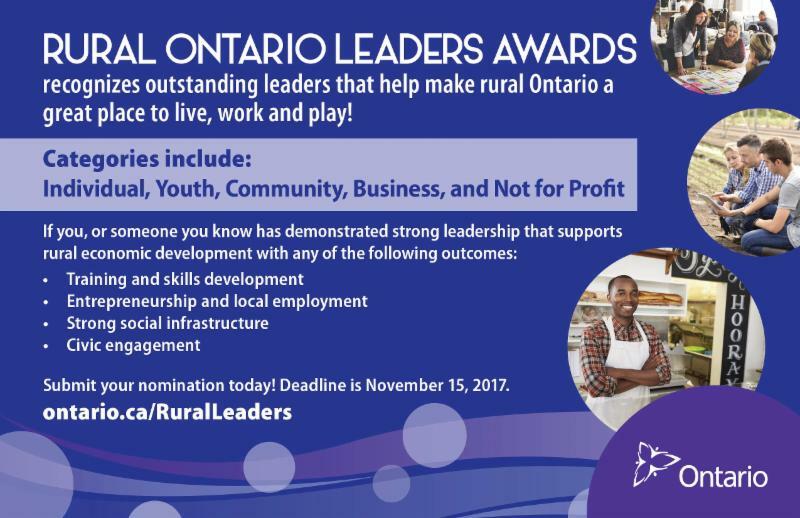 The Rural Ontario Leaders Awards recognizes outstanding leaders that help make rural Ontario a great place to live, work and play! Considering submitting a nomination if you or someone you know has demonstrated strong leadership that supports rural economic development. The categories include: Individual, Youth, Community, Business, and Not for Profit. Nomination deadline : November 15, 2017. For more information, visit: ontario.ca/RuralLeaders.